A clock is a nice accessory for every home and it may accent your decor and even add color and print to the space. Skip boring and plain ones and look for bright clocks – on these pale winter days there’s nothing better than colors! These colorful clocks will brighten up your space adding fun to it, read the tutorials, choose and go craft one or several ones for cheering up your space. Delicious and colorful cakes with confetti are always to the point, everywhere and for every occasion. This whimsy and fun colorful clock shows off a sliced cake and such a fun and bold clock is perfect for any kitchen or even kids’ room! Crafting it won’t take much time, craft it and get inspired! 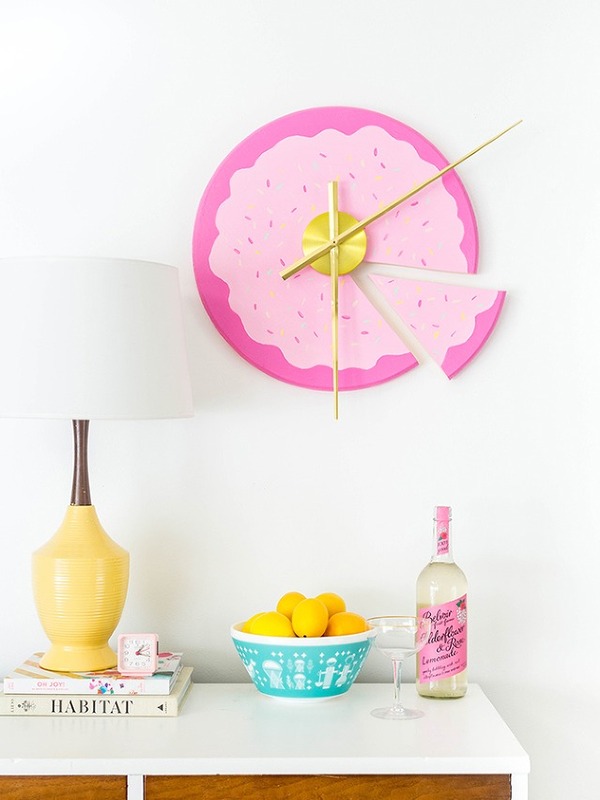 Add fun and brightness to your home with this colorful and whimsy clock! For this DIY confetti clock the author used metallic circle confetti instead of paper and boy does it sparkle! Plus it is super simple to make! When the sunlight hits the confetti the DIY confetti clock almost resembles a disco ball because colorful light bounces around the room. 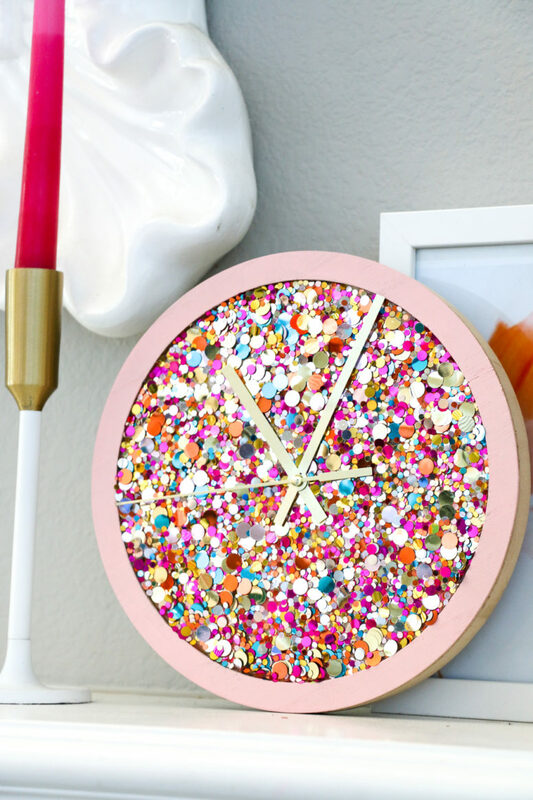 Now that is a clock that has my confetti and disco ball loving heart! 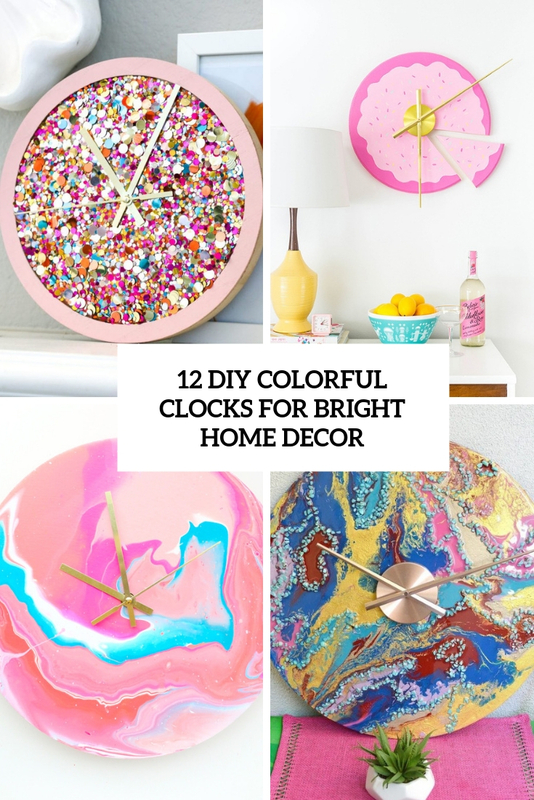 If you like colorful clocks, if you enjoy marble home decor trend and if you want to have something bright and marble at the same time, here’s a cool tutorial for you. If you aren’t familiar with the marbled paint pouring technique, then you need to know that the pouring medium is a way to thin out the acrylic paint to make it flow smoothly and create a marbled effect when poured. 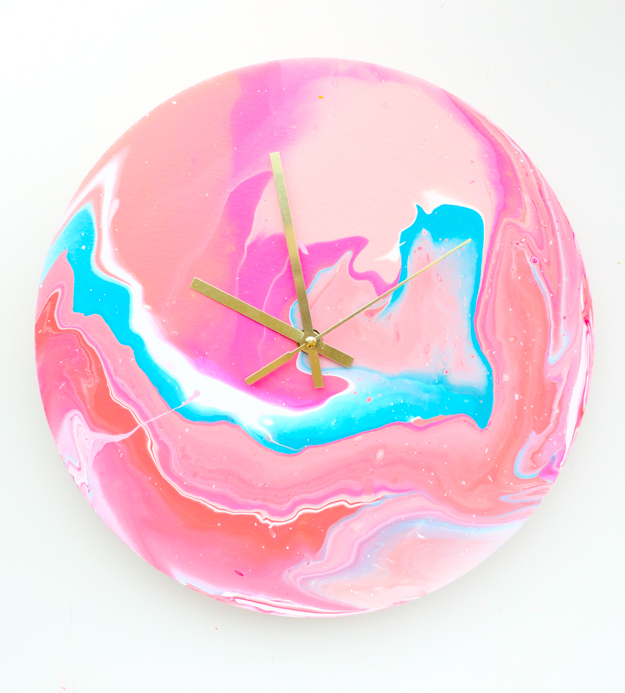 Keep reading the tutorial and make your cool and colorful marble clock. 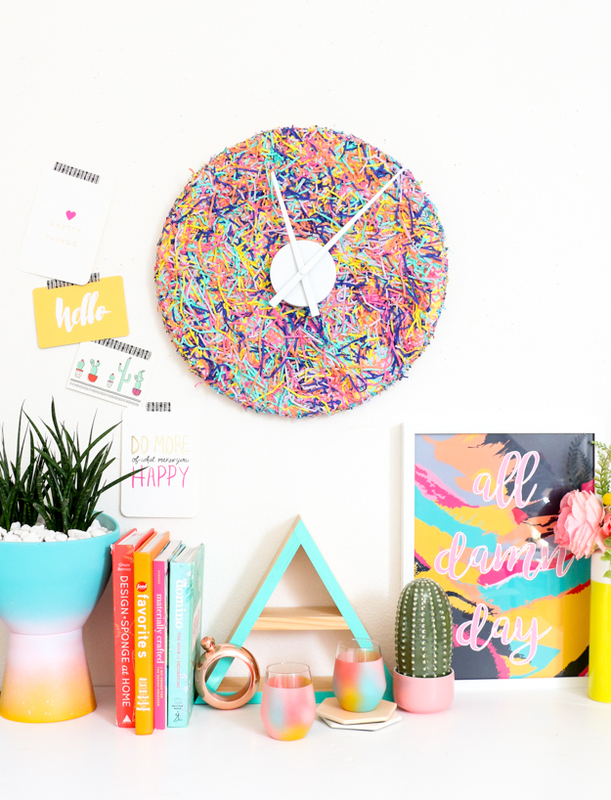 This DIY colorful confetti clock totally fits the bill! For this project the author used pre-made confetti shreds from Target, but you can easily customize your confetti choices to get just the right color and look for your home. Such a bright and whimsy clock will finish off your colored space or add a fun touch to a neutral one, and if it’s a serious home office, a colorful clock will cheer it up! Pompoms are a popular material for crafting, and they can be used for anything from rugs to wall art pieces. 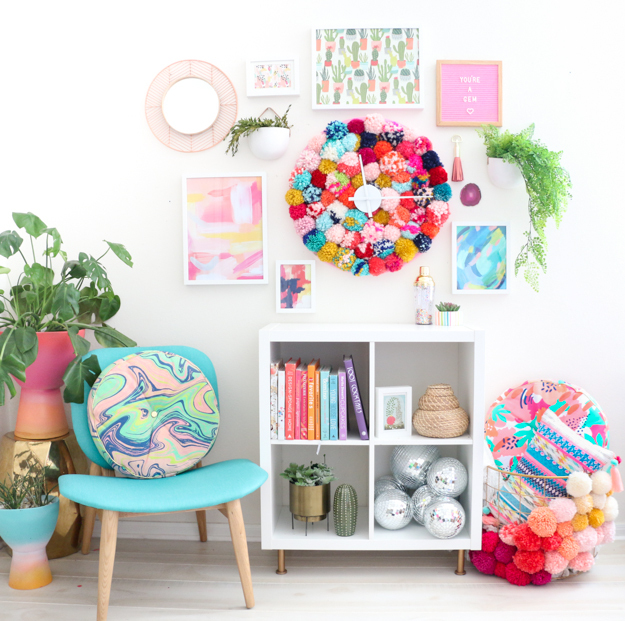 This bright and fun pompom clock is a statement piece and it completely draws in the eye. So, it really is as simple as gluing pom poms to a piece of wood. Read how to make this clock and brighten up your space with it. Marble home decor trend is popping up and everyone’s incorporating it here and there. You needn’t spend tons of money to decorate your home with style, you many just go for other means to add marble to your home, for example, contact paper or resin. 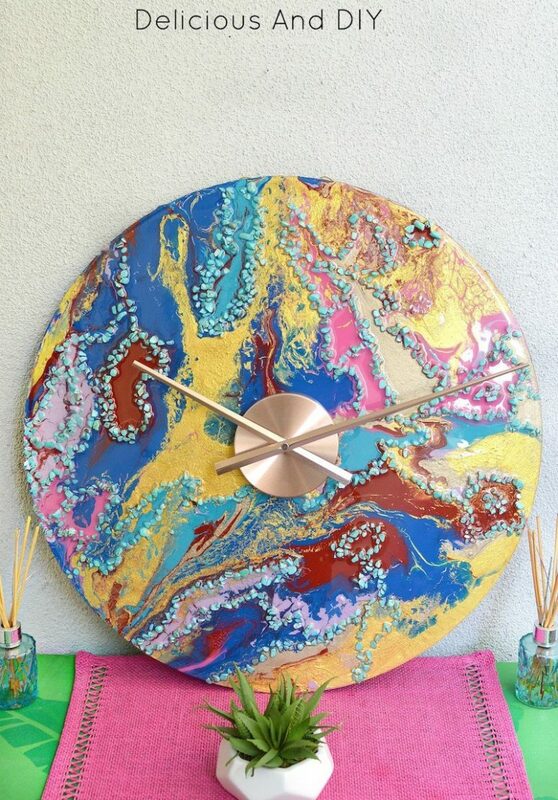 This colorful and bright clock is done using colorful resin, and it looks really statement. Read how to work with resin and make one for your home, get inspired! Watercolor is another cool home decor trend, it’s a very fashionable way to add color to your home. 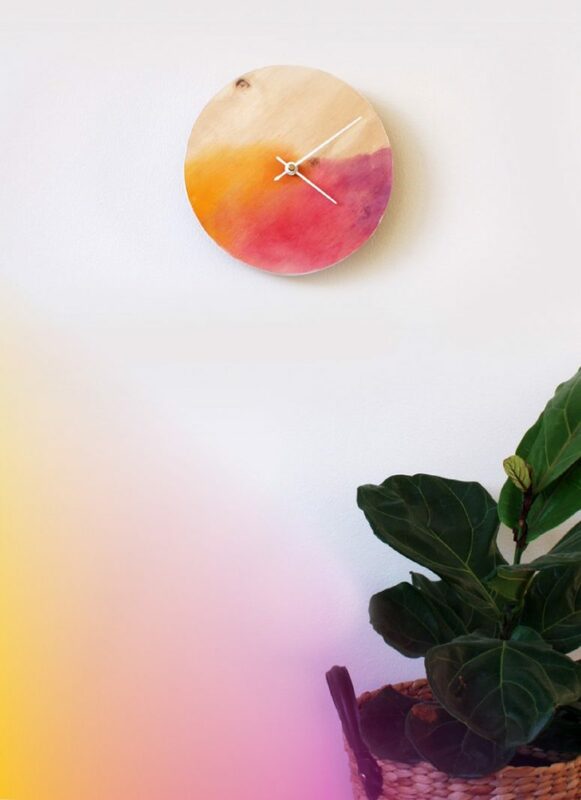 This amazing clock is a watercolor one and it’s very bright – adding it to your home will make your home fun and whimsier. Grab your paintbrush and a few watercolors and transform an ordinary wall clock into a piece of art you’ll be proud to display. Ombre is one more trendy and edgy way to work with color, rocking this option will make your home look much more modern at once. 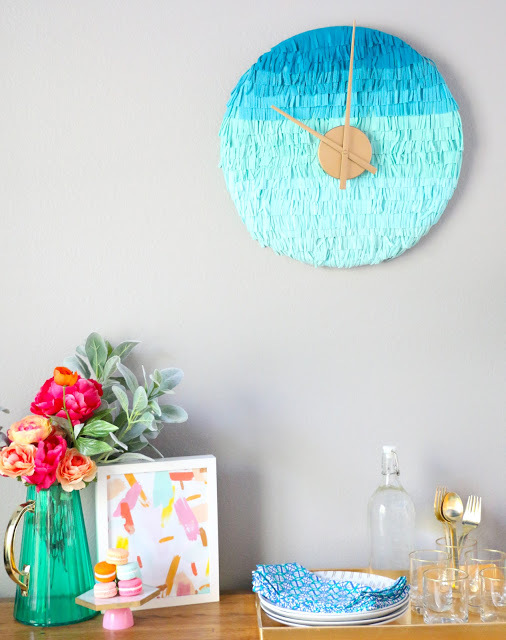 Make this bold and fun ombre fringe clock easily and fast and add a touch of whimsy to your home. Just look at all that texture! And those shades of seafoam, mint, turquoise, and teal have me going all heart eyes. But don’t be intimidated, this clock is super easy to DIY. Walls looking a little drab? 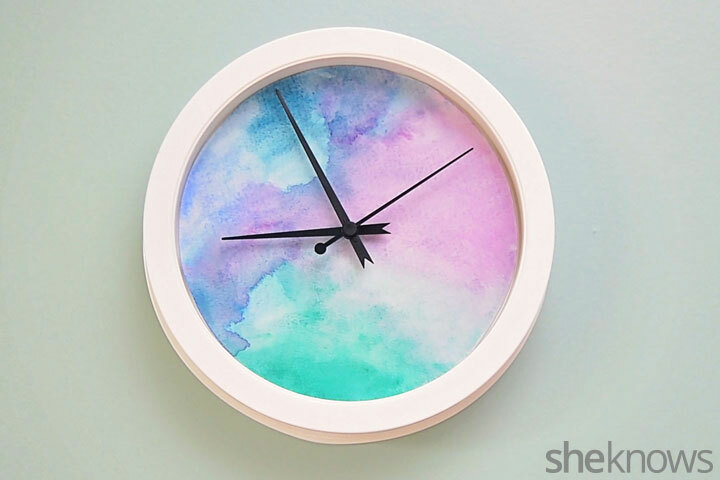 Make your own clock with some beautiful watercolors! I love the bold warm shades used to make the watercolor though you may change them for something different if these don’t match your home decor. Read how to make the clock fast and brighten up your space. Create a crafty clock design with this step by step tutorial! 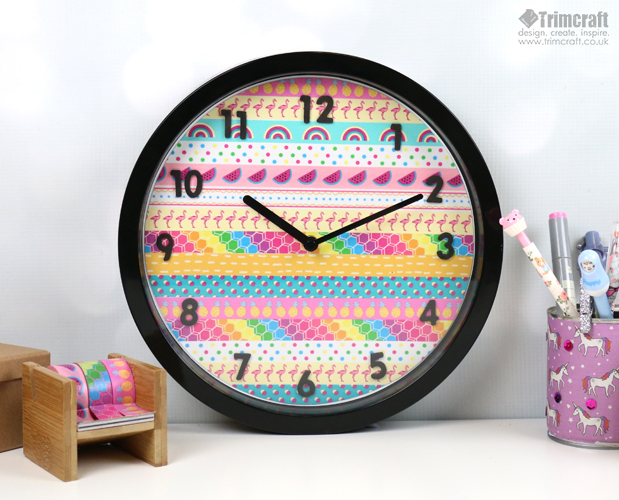 This bright clock is easily made with colorful washi tape of different kinds. The authors have kept the original numbers underneath the design so if you want the clock back to its’ original form, all you would need to do is peel off the washi tape design. Read the tutorial and make the clock right now! Rainbows bring a dreamy touch to any space and lots of color, of course! 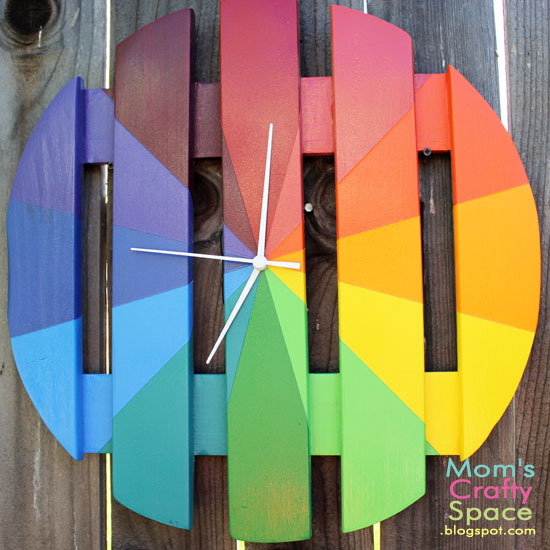 This bright clock can be used both indoors and outdoors and it features a super colorful rainbow! The piece is made of a usual wooden round, which is painted in bright rainbow shades. Read the tutorial to make one. 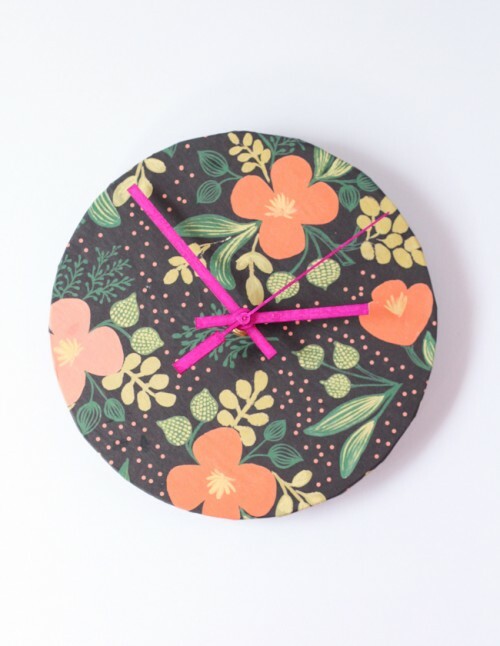 The last but not least is a bright yet moody clock done with wrapping paper. You may actually use any wrapping paper that is left after packing your gifts and even contact paper or stick to some moody or bold wallpaper. Read the tutorial and make this bold clock easily and fast.